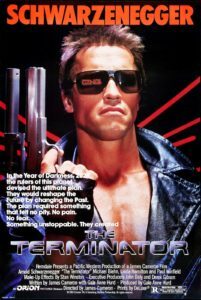 027 – The Terminator | All Eighties Movies. All The Time! ← Spotify Movie Music playlist! It’s 1984 and we’re running around Los Angeles dodging bullets and being chased by the legendary Cyberdyne Systems Model 101. That’s right, this week Gidge and Angry talk Terminator! This entry was posted in Podcasts and tagged action, arnie, terminator. Bookmark the permalink. Great work Angry and other girl. Really awesome pod cast. Love this movie. Sorry – is it Gidgit? But really awesome podcast. Nailed the Terminator podcast. New fan!